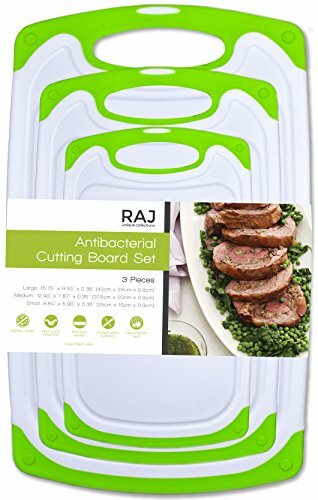 SET of 3 LARGE GRIP GREEN CUTTING BOARDS - Raj Antibacterial, BPA-free, polypropylene boards come in 3 convenient size Large 15.75 x 9.45 inch, Medium 12.40 x 7.87 inch, Small 9.84 x 5.90 inches and 0.35 inches thick. They have large soft grip handles and are white colored board with green boarders. DEEP JUICE GROOVE - One side juice grooves keep liquids on the board so your countertop stays clean from juices and a flat surface on the other side giving you more cutting room. DISHWASHER SAFE - Those Polypropylene dishwasher safe boards will not degrade or warp in the dishwasher and are stain resistant.